DALLAS, Oct 28, 2011/ — It’s hard to believe, but Christmas is just around the corner. To help get everyone in the spirit, the Postal Service kicked off the 2011 holiday season with the issuance of the new Christmas stamps. Williams was joined at the stamp dedication by James E. Lee, president, American Stamp Dealers Association; Wade E. Saadi, president, American Philatelic Society; Raschelle Parker, manager, Marketing, New York District, U.S. Postal Service; and Stephen Kearney, executive director, Stamp Services, U.S. Postal Service. “All of our holiday stamps are being issued this year for the first time as Forever stamps,” said Kearney. “These popular stamps rank among our best sellers. Inspired by 1950s-era ornaments, the festive Holiday Baubles Forever stamps feature four colorful ornaments sure to add to the joys of the season. These baubles also may inspire fond memories of beloved ornaments from childhood — objects that still have the power to enchant us today. Art director William Gicker used illustrations by Linda Fountain of Hilton Head Island, SC, to create the ornaments shown in the stamp art. For many years, the Postal Service has issued traditional Christmas stamps featuring the Madonna and Child. The Christmas stamp for 2011 presents a detail from a painting by the Italian master Raphael, entitled Madonna of the Candelabra. This circular painting dates around 1513, and, is now in the Walters Art Museum collection in Baltimore, MD. In 1508, Raphael was summoned by Pope Julius II to Rome, where he spent the last dozen years of his short life in an inspired burst of activity. The masterpieces he produced in Rome include the painting reproduced on this stamp. The stamp art is a detail of the painting, as the original photograph was cropped to fit the stamp format. Richard Sheaff served as art director for this issuance. 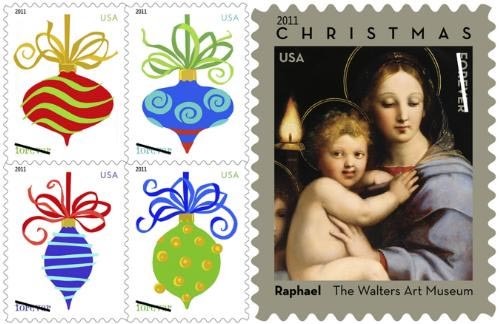 Both the Holiday Baubles and Madonna of the Candelabra by Raphael stamps are being issued as Forever stamps which make them good for one-ounce First-Class Mail postage forever. “In this small way, the Postal Service extends its warmest wishes to you and yours for a very festive, healthy and happy holiday season,” said Williams. The stamp is already on sale at Post Offices nationwide, online at www.usps.com and by phone at 800-782-6724.